Training Provider CRM is crafted for Training Providers who focus either on Retail or Corporate Training. Built on award-winning Zoho CRM, it handles everything that’s required for a Training Provider to run their business: Managing Leads and Contacts, Tracking Opportunities, Invoicing and Recording Payments, Enrolments, Managing Courses and Instructors, Tracking Activities with the ability to Integrate with your Website, Email system and Social Media channels. Categorize Leads into Retail or Corporate Training. Capture the Course They are Interested In. Once Leads look prospective, Convert them into (A) For Corporate Training: A Company, Contact and a related Engagement (B) For Retail Training: Contact and a related Engagement. Generate a Quote from the CRM. Convert a Quote into an Invoice and Start Recording Payment. Record Which Candidate Enrolls to Which Course. Capture Course Result and Next Recommended Course. Capture Course Details with Start and End Date, Capacity, Class Duration, Class Room, Instructor Name. Record Instructor Profile with Courses Offered. Capture Vendors and Their Contacts. Record Purchase Orders for Books and Other Course Materials. Track the Campaign Result inside CRM. GoldenLion has a very strong customer oriented team. Their understanding of Zoho is exceptional. Keep up the Good work! We have been using Zoho around a year now, and sought help from GoldenLion due to our inexperience with the tool. Since then, they have been a tremendous help.Very efficient, friendly and knowledgeable. I highly recommend their services, and couldn’t be happier with the service we have received so far. Send them an email, and they answer within the hour! Alpha Aviation Group, a global brand in the field of aviation training for the airline market, has recently engaged GoldenLion to develop and then support the Zoho CRM product as its basis for a structured and transparent sales process. How Much Does Training Provider CRM Cost and What Do I Get? Training Provider CRM is available at an One-time fee. However you need to pay subscription fee for Zoho Suite of Apps. We will deliver you the customized version of Training Provider CRM within 7 Working Days. You can sign up for a Free Trial here. Note: this will be the Standard Zoho CRM when you sign up, Not the customized version for Training Provider CRM. Can I Further Customize Training Provider CRM in Future? Why Can't We Customize Zoho CRM Ourselves? You can of course! However there will be tremendous learning curve involved. 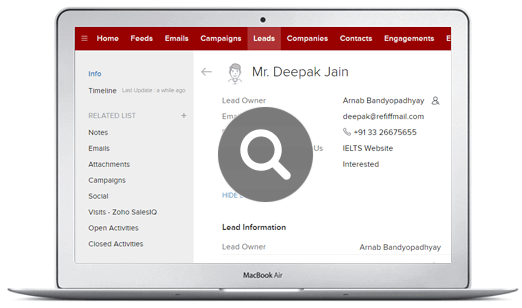 We bring together our experience of implementing Zoho CRM across hundreds of companies and help you leverage this application in the quickest possible time. Can I Have a Demonstration Before I Buy Training Provider CRM?